In my current project with JavaFX, we need cells to flash when their value has been updated so that a user would notice the change. Although this sounds like an easy piece of code to write, it took three tries to get this right. The first versions that I wrote used CSS manipulation and timer which updated the opacity value. This created a huge overhead since CSS handling in JavaFX is not effective and should be avoided in cell updateItem method if possible. Eventually, I ended up with a solution that uses StackPane with BorderPane as a background and FadeTransition to handle the animation. Hopefully it helps if you are building something similar. This is a learning diary post from Uni Helsinki course Software Factory / Facebook Academy – SocketIO team. For more info about this course read “Ready, Set, Start Coding!”. Refactoring is a technique of improving design and implementation without (or hardly) changing the behavior of the code. It is a process of applying series of small behavior-preserving changes that clean up code, reduce the clutter, find code that smells and improve code readability. These changes should be so small that they don’t break existing unit tests, which should be run before and after each change. This way we can reduce the risk of introducing errors. Refactoring can be seen as a long-term investment that helps to keep your code from decaying over time. Why we need to refactor your code? Usually, the first time we implement something, we write code that only works without thinking too much how well it does it. When we continue writing code that only works we constantly increase the technical depth because most of the time we don’t find the best solutions and the cleanest way to implement something, or we don’t realize that a functionality or part of it already exists. Regular refactoring is a way to ensure that this depth doesn’t grow until the code base becomes uncontrollable. Finding a good time for refactoring can be sometimes cumbersome since we are not implementing new functionality and it might be hard to see the value of refactoring. It is good practice to have a habit of refactoring code, for example. After fixing a bug because this forces us to read code again and by doing so we might find places that could be refactored. After code reviews (if they are part of your development process) as other developers might have more optimal solutions for implementing certain functionality. Before merge request to verify the quality of your request and that your code meets the conventions of a project. Upon noticing you are repeating yourself. Extract a class – When you notice that a class is growing up into hundreds lines and it might have multiple responsibilities or the cohesion between the methods inside is low, it might be a good idea to break the class into several smaller ones. Extract method (closely related to the one above) – While doing refactoring you might notice that some method inside one class is more related to another one, so move it there. Rename methods – If a method name is not describing the functionality well enough. Introduce explaining variable – Shortest possible code is not always the best option: If, for example, understanding what a loop, if-clause with an assign operation or a long-chained method call does takes more than a minute introducing an explanation variable could work. Remove duplicate code – Remember the DRY principle (Don’t Repeat Yourself) as it is always good to keep your code neat and tidy by removing duplicate functionality. It’s been a long while since the last time I did put some hours into this project so now it’s time to get back on track. Creates a variable on the variable object on the global execution context and which is the global object that on browsers is aliased as window. This creates a property on window that you cannot delete and it is also defined before the first line of code runs. The window symbol itself, is a actually a property of the global object that it uses to point itself. Note also that on IE8 and earlier the property created on window is not enumerable, in IE9 Chrome, Firefox and Opera it is. Creates a property on the window object implicitly. As it’s normal property and it can be deleted. Creates a property on the window object explicitly. It’s a normal property and can be deleted. Keyword this in the global execution context references the global object, so the code is identical to case above it. the best practice is to creating a namespace variable, that you use for the needed properties. Next this on the Socket.io -team. During the weekend I have time to write about the architecture in Socket.io project. Last thing I developed was stress/load test cases for Engine.io. One thing learned was that with node.js it is impossible to have control over garbage collection, it can be called when using expose garbage collection mode in node. This helps you to find out how much memory is being used in different parts of code. Problem with my code was that engine.io-client in clients array did not close properly and garbage collection did not work. Hopefully I would find a bigger task for the next couple of weeks, now that I have more time to put into this project. One thing before going forward is to finish stress/load test cases. 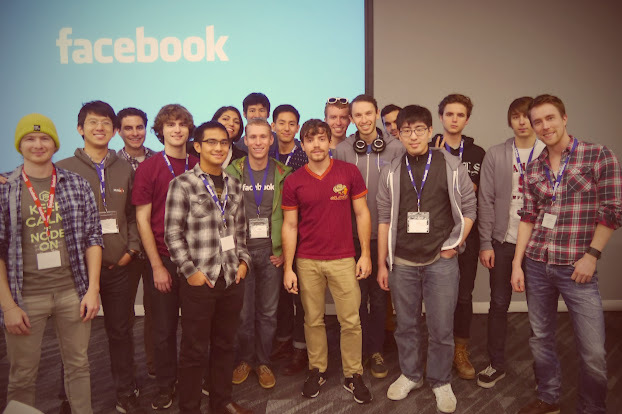 At the weekend all the members of Facebook Academy traveled to San Francisco for the kickoff hackaton meeting in Palo Alto. The trip from Paderborn to San Francisco was extremely tiring. I had to leave Paderborn the night before my flight since, there were no trains going to Dusseldorf airport early enough to catch my flight to Paris, where I had my change. So I left Paderborn around midnight via Soest to Dortmund and finally Dusseldorf Airport for my flight around eight o’clock. Where is this place anyway? At the first day we had a bus transportation to University of Stanford, where Jay Borenstein welcomed us to this year’s Facebook Academy. Afterwards Scott Chacon GitHub Co-Founder gave a speech ‘How to use GitHub’. I would argue that for most of the people there using GitHub is trivial, but luckily the talk was about how to use GitHub “profoundly”. Next stop on was Facebook office and a meeting room, that turned out to be the geek hive for us, where we would spend the next two and a half days. Socket.io -team had a big table reserved at the middle of the room. After short and really informal introductions we gathered around the table for confronting the bugs in Socket.io. In the Hackaton I continued fixing the issue what I had started earlier issue 232, creating a simple test case for FlashSocket support in Engine.io-client. Even from the beginning the issue seemed so small that there had to be something buried. As thought it turned out that FlashSockets was never tested and seemed that no one had ever used it in Engine.io-client. There was something wrong even though the implementation works in Socket.io. The first encountered problem was that Engine.io did not receive flash socket policy request from web-socket-js module/flash. With the help of Roman, our second mentor, we figured out that the problem was Node.js’s way of handling messages and how fast path is implemented. Finally the mentors decided that Engine.io would not implement flash policy handling at all and Engine.io-client would implement a way to specify where flash policy could be downloaded. Responsibility of providing the policy would be user’s , they could easily implement own policy request handling server, as in this example. Other obstacle on the way was that in Engine.io policy handling had some obsolete legacy code that was never called, this caused some extra confusion on the way to finding out what was wrong. The greatest learning experience of this whole thing was how to debug Node.js program. For anyone encountering problems with Node.js I would recommend using debug module and extensive use of debugger; – call that fires up debugger in browser. 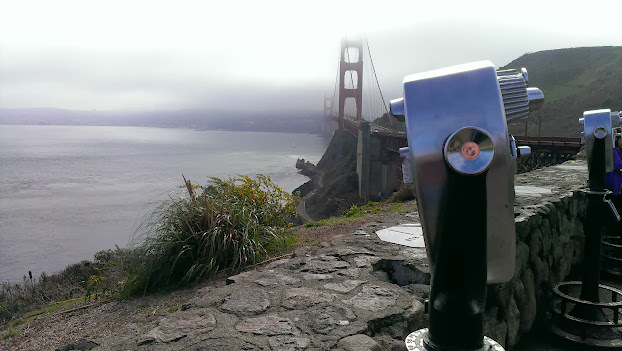 Facebook provided us hotel rooms for our official and after that I stayed at my friend’s place, who works at Humble Bundle and visiting their office in the center of San Francisco was one of the nicest things during my trip. On Tuesday and Wednesday I had plenty of time on my own since my friend went back to work, so those were the days for sight seeing. Here couple of pictures from the way. I am planning to write stress tests from Engine.io to see how well it perform and to find out some bottlenecks in the current implementation. What tools should I learn to use when I develop Socket.io? Browserify. “This is how we write code that runs both in Node and the browser. We use it for all our clients.” – Rauch. It allows to use node.js-style module system that compile for use in the browser, it supports exporting external methods and properties using the module.exports and exports variables. With browserify we can use require(./foo); function to use core modules and many of the modules on npm. , . It seems like the biggest issue to tackle before writing code is that you really need to know how everything works before starting to build something on your own. Although the codebase of Engine.io is only around 1000 lines of code, understanding how supported transport protocols (XHR/JSONP polling, WebSockets and FlashSockets) work takes some time. In my opinion, in order to understand Engine.io, Socket.io and all the related projects, readme-files and test cases that arrive with the projects are essential. They describe well how things are expected to work and how functions should behave. First thing to do at the beginning of next week is to write an additional blog post which explains concepts and technologies related to this project and creating a small example project that uses Socket.io. “The central problem this poses is: how do we switch transports without losing messages? Engine only switches from polling to another transport in between polling cycles. Since the server closes the connection after a certain timeout when there’s no activity, and the polling transport implementation buffers messages in between connections, this ensures no message loss and optimal performance.” – from Engine.io readme file. Ok, that is a good start when trying to understand what problems we are facing – but the questions remain where this project is heading to, what functionality will be developed next or which issue needs to be fixed? This is the first learning diary blog post for Software Factory / Facebook Academy course at University of Helsinki – Team SocketIO – I am really hoping that this will be also be my personal kickstart to OpenSource development. In short: The Computer Science department at the University of Helsinki organizes the course in collaboration with the Facebook Academy. In the course students from all over the world contribute to open source projects and receive valuable experience. Every open source project has one or more mentors that guide this new horde of young developers with their journey to open source development. I chose SocketIO project as my first option and, gladly, I was placed in it. The course itself does not have a strict form, it should be considered as an experimental learning experience, which means the more effort we (students participating) put into developing and contributing the more we learn and get out of it. What is SocketIO? What is it for? Who made it? Collecting pieces of information, organizing yourself and familiarizing yourself with the codebase. As I do with every bigger assignment or a project that I have in hand, I collect the pieces of information and store them in Evernote, collect the intermediate tasks and organize them on a Trello board. After getting started with the development I use Trello board to organize and record tasks that I have done with the related information. Sometimes in programming it is needed to scale a known number range into another range. I needed this for an exercise in Data and Information Visualization course. I knew the range of numbers I had scale into, a range between 0 – 1020 to implement a color temperature for my visualization. COLOR_MIN and COLOR_MAX holds the range that we are scaling to (0 and 1020) , min and max are the maximum and minimum values of the original range and this.power is the value that we are translating. Hopefully this help if anyone is struggling with the same problem.